So everyone under the sun except for me because I’m under a rock has already read this glorious book and reading it now is making me wonder why the heck I hadn’t already read it earlier? I’ve already read Six of Crows and Crooked Kingdom and like everyone says, I would agree that they’re much much better than this book, but that isn’t because this one is bad, it’s because those are on a league of their own. 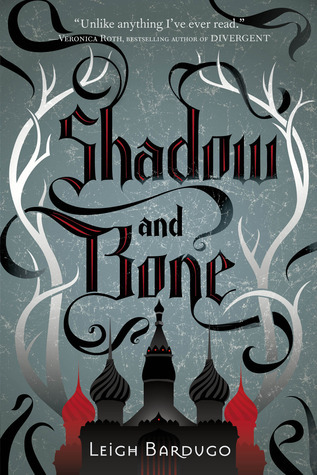 Shadow and Bone is a fairly typical chosen one fantasy story. Ravka is struggling because of the fold and the evil monsters it contains that rips through the kingdom. Alina previously thought that she was perfectly normal, but when a terrifying encounter in the fold reveals shocking skills, she is taken away from her old life to live with Grisha, who are basically magic in their manipulations of the world. I really love the entire Grishaverse and the world that Bardugo has created. I loved in this book especially getting to see and learn more about the Grisha, and all of their unique magical powers. Alina throughout the book is still learning about Grisha, so the reader is able to discover them and their unique lore with her. I loved especially seeing the Grisha freely train and use their powers together. I’m not entire sure how I feel about Alina herself. There were times when I just wanted to smack her for being annoying and whinny, but there were also times when I was applauding her for her ability to develop her powers and herself when thrown into an entirely new, uncertain world. There did seem to be a love triangle happening, and I guess that’s all you can ask of a novel published in 2012 haha but that didn’t make it any less annoying. The Darkling…I’ve seen from other people’s reviews and chats about this book that a lot of people like him but basically I kind of hate him? Mal is kind of annoying too, but overall I like him much better than the Darkling. The ending of this book was what really sold it to me and made me determined to read the next book (along with not wanting to be so alone under my rock haha). I honestly had no idea what was going to happen and was right on the edge of my seat turning pages as fast as possible!! I need more time in a day. My kids know exactly when I pick up a book. It’s hard finding time to read but I manage. While a post on it actually. Thank you for such a fantastic in depth review. I love the quote that you started it with! My daughter has been asking about this one. Nice to see it get such a high grade. Great review! I’ll have to have her read your review as well.